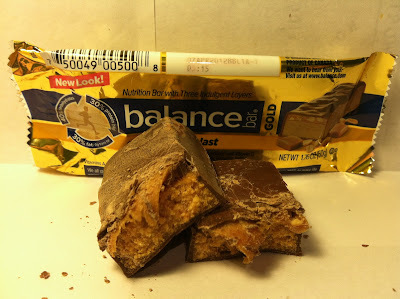 This is certainly not my first Balance Bar review, nor will it be my last. That said, one aspect of Balance Bars that I haven't really spent a lot of time on is their Gold line of bars. Basically, they describe their Gold line of bars as your typical Balance Bar with an extra layer of decadence. Um, okay. 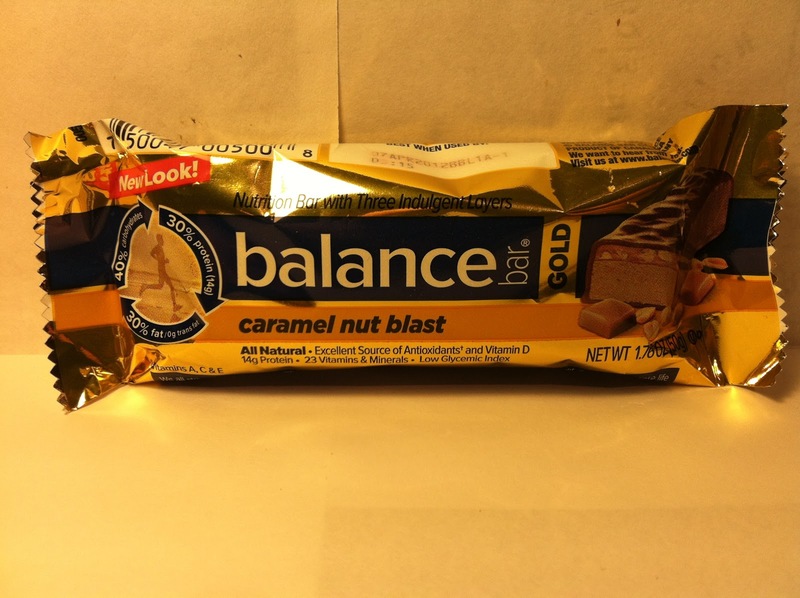 Anyway, this leads me to the Caramel Nut Blast bar with its "three indulgent layers". I picked this up for $1.09 at Meijer and it packs 200 calories and fourteen grams of protein into a 1.76 ounce bar. The three indulgent layers in this bar are peanut (peanut butter), caramel and chocolate. The peanut (peanut butter) layer is the base layer and it's laced with your standard mix of chemicals and what not to bring the extra protein punch to the bar. On top of that base layer is a layer of sticky, gooey caramel (it stretched when I broke the bar apart for the above picture; you can see some of that in the picture) that is laced with the occasional peanut piece. Then, the entire bar is shrouded in a crumbly and hard chocolate layer that spilled everywhere when I broke it in half (those are the bits of chocolate scattered everywhere above). They've got a recipe for a winner with chocolate, peanut (butter) and caramel at least, but how did it taste? Well, it tasted just okay. All the flavors were in the bar, but they were not as you'd expect them to be. The peanut butter flavor lacked any real sweetness and was just a hearty peanut butter. The problem with this peanut butter/protein layer was that it was rock hard to chew at the onset of the bite. It softened up eventually after some work, but if you are going for the indulgent angle, I don't think you should make your audience work too hard for that indulgence, but hey, maybe that's just me. The caramel, on the other hand, did provide some sweetness, but its gooeyness made it stick to the roof of your mouth and teeth and while that is not a big deal, it is slightly annoying. While both of those layers had their frustrations, ultimately they could be overlooked. The one part of the bar that could not be overlooked and led to the most frustration was the chocolate layer. Like I said previously, it was fairly hard in texture and that hardness was due to its thickness and this was something that you could taste. The thickness, unfortunately, did not bring a sweet flavor to the chocolate and I would say that the taste of it was flat and would almost use a word like "burnt" to describe its taste. Just a totally odd flavor profile that I really don't expect from chocolate, especially when you are mixing it with peanut (butter) and caramel. All in all, the taste of this bar was hearty and rich, but not in a good way. Buy It or Fly By It? Despite its shortcomings, this bar wasn't horrible, but it wasn't good either and I have to give it a FLY BY IT rating. In my mind, this bar was somehow a cross between a regular Snickers and a Peanut Butter Snickers and it failed to really be like either one. Balance usually does a pretty good job with their bars, but this one was just mediocre at best, so steer clear of this one and give one of the others a shot. Like I said in a previous post which you deleted try to give some constructive criticism, you should try these bars without refrigerating them. I've had this bar multiple times and it has never been hard or crunchy. I believe that effect is coming from your chilling of the bar making them harder than they were meant to be. I'm not trying to attack your reviewing style because that'd just be stupid I'm just saying try them without refrigerating because most people are going to buy these and consume them as is. I let them sit at room temperature for close to thirty minutes before I eat them, so that they come down to a "natural" state. 30 minutes isn't enough. Lol.